A magnificent amore heart diamond necklace from Chopard. 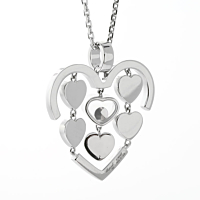 The 18kt white gold open heart necklace frame is bezel set with brilliant round diamonds on one side, and features three columns of tiny solid white gold hearts linked together. One accent heart contains a single, larger round diamond. 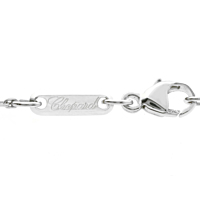 The pendant is connected to a round gold loop that hangs gracefully from an 18kt white gold chain necklace.